Why is it so dispiriting? For that matter, why are vegetables in general so dispiriting? I guess there's a lesson in there somewhere about Things That Are Good For Us. Some years ago, probably quite a few though I'm not sure, I read a review of one of Joan Didion's books which said something to the effect that the chief or most engaging characteristic of her work is her sensibility. I may have that wrong, but whether or not it's what the reviewer said, it seems apt to me, based on the fairly small amount of her work I've read: the novel Play It As It Lays, the essay collections The White Album and Slouching Toward Bethlehem. I just finished the last of these, and that notion occurred to me several times during the reading. What is that sensibility? Sensitive, intelligent, unillusioned, depressed, neurotic, nostalgic, fatalistic, romantic, cynical, disappointed--the last three are essentially aspects of one thing. All three of these books were written in the 1960s, and it's pretty clear that she was pretty unhappy at the time. I don't know whether things got better for her or not. I've had Slouching on my shelf for some time, and had read a couple of the essays in it. I picked it up again because the title essay is her report on the Haight-Ashbury hippie culture in 1967, when it came to the attention of the whole nation as "the Summer of Love." I find Didion's perspective on "The Sixties," by which I mean the whole phenomenon which has been so heavily mythologized since it actually occurred, essential. The prevailing myth, subscribed to by most of the social-political left (which means that it's the dominant one in the media, the entertainment industry, and the academy, and therefore dominant in general) is that it was a time of awakening and liberation, and that the summer of 1967 was one of its high (ha ha) points, the moment when a counter-cultural impulse which included political, social, and philosophical revolutions came to flower. The countervailing myth, subscribed to by most of the social-political right, is that it was a time of disintegration and collapse. Didion stands somewhat apart from those categories and those views. I take her to be more or less a liberal, but she is, as I said earlier, unillusioned, and she reports what she sees without, as far as I can tell, any ideological filter. She is, in a sense, conservative, in that she seems to suffer from a sort of civilizational vertigo, and to want to hold on to whatever stability she can find. Accordingly, she tends to focus on the crazy aspects of the hippie subculture, which were undeniably there and significant, whether you think it was on the whole a good or a bad thing. I'd say this essay, like its companion, the title essay of The White Album, is essential reading for anyone who wants to understand what was going on then. Or wants to understand what it was actually like. Didion's view is not the whole story, but it is a true and important part of the story. We were seeing the desperate attempt of a handful of pathetically unequipped children to create a community in a social vacuum. She herself seems to be caught out in that vacuum, as the essay "On Morality" shows. Apart from all that, she is a terrific writer, in both style and substance, and I think anyone who appreciates good prose and deep intelligence would value this book. Not all the essays are of equal quality and significance, but all are at least interesting. I'm going to quote from one of them, "I Can't Get That Monster Out of My Mind," about the movie industry, because I think it's so striking a picture of the mentality that apparently set in there in the early 1960s, when the decline of "the studio system"--the nature of which has never been clear to me--gave directors new freedom. And is still prominent. One problem is that American directors, with a handful of exceptions, are not much interested in style; they are at heart didactic. Ask what they plan to do with their absolute freedom, with their chance to make a personal statement, and they will pick an "issue," a "problem." The "issues" they pick are generally no longer real issues, if indeed they ever were--but I think it a mistake to attribute this to any calculated venality, to any conscious playing it safe.... Call it instead--this apparent calcuation about what "issues" are now safe--an absence of imagination, a sloppiness of mind in some ways encouraged by a comfortable feedback from the audience, from the bulk of reviewers, and from some people who ought to know better. Stanley Kramer's Judgment at Nuremberg, made in 1961, was an intrepid indictment not of authoritarianism in the abstract, not of the trials themselves, not of the various moral and legal issues involved, but of Nazi war atrocities, about which there would have seemed already to be some consensus.... Later, Kramer and Abby Mann collaborated on Ship of Fools, into which they injected "a little more compassion and humor" and in which they advanced the action from 1931 to 1933--the better to register another defiant protest against the National Socialist Party. She makes a number of judgments about directors which I don't necessarily share, including a negative one about Bergman, a terrible failing in my eyes. But: "they are at heart didactic." That's still a justifiable complaint. And aren't they self-righteous and self-important about it? The above is quite inadequate as a review of the book, by the way. I've focused only on a couple of things that happen to especially interest me. There is much more to say of both book and author as seen therein. I might add that her use of Yeats's poem "The Second Coming" in her title and as epigraph were probably not at the time the somewhat tired devices they've since become, when even politicians quote the poem--or at least the one sentence, "The center cannot hold." This porch ceiling has been painted a color known around here as "haint blue." I only learned of this recently. Has anyone else heard of it? Here's an explanation. Most people would just call it sky blue, I guess. There is a brewery called Haint Blue in Mobile. I'd like to support them but there is a brewery right here in my town so I usually buy theirs. Haint Blue has an odd beer called Marianne, which is spiced with saffron. You can read about it here. Rather in the "hmm...interesting" than "mmm...wonderful" category to me. May all these little breweries thrive for generation unto generation. The success of the craft beer movement is a great compensation for living with the craziness of our time. In 2012, David Graham, writing in The Atlantic, noted a study that showed that a growing number of Americans would be displeased if their children married someone of the other party. That sounds bad. It is bad. But if you change the "liberal" and "conservative" categories to "fervent atheist" and "fervent Christian," it makes sense. Even without actual animosity, two people with such seriously opposing views on such fundamental matters ought to think twice, at least, about getting involved in love and marriage with each other. More disturbing than such views about romance are the instances I've seen of liberals not wanting to live in the same neighborhood as conservatives. Maybe the same thing happens in the other direction, but I haven't encountered it. Once again I assert that the culture war is actually a religious conflict. I say this not for the purpose of inflaming the situation but of understanding what is actually happening. It's possible--only possible--that if people on both sides were more aware of this they might make more of an effort to tamp down their anger. Or then again it might make things worse, if people recognize that there are irreconcilable differences over first principles, not just policies. Well, even so, I prefer to have a clear understanding, even if that means recognizing that a situation is more dire than I had hoped. In that long Facebook argument (381 comments!) I mentioned a few weeks ago in which I was taken to task for my comments about toxic femininity, I was criticized for "attempt[ing] to be reasonable" when the other person thought (apparently) that I should be emotional. I almost took this as a compliment, because I think reasonableness is in pretty short supply these days where political-cultural matters are concerned. That was certainly on display this past week in the matter of parents and children being separated when families enter the country illegally. As I always take pains to say whenever I discuss anything having to do with Donald Trump, I did not support him, and the best I can say about his presidency is that it hasn't been as bad as I feared. But the open crusade waged by the media, the entertainment industry et.al. is so disproportionate to what he is actually doing that when some "Oh my God did you hear what Trump just did?!?" story hits the news, which it does at least once a week, I automatically assume that it's exaggerated. I wait several days before even bothering to check it out, because the chances are very good that it will turn out to be either not as bad or not as significant as reported, and sometimes that it's not entirely true. It often seems that the anti-Trump forces never heard the old fable of the boy who cried wolf. Or didn't understand its lesson, and thought that the problem was that the boy didn't scream loudly enough. So: no, there is nothing familiar, not even vaguely, to the Holocaust, and it is a disgrace to suggest that there is. I’m not going to go into a long post describing the Holocaust, but it is clear to all who study history that the death camps and even work camps were not refugee detention centers, and the people in them (Jews and others) were not illegal immigrants asking for asylum or seeking to become German citizens (or Polish citizens for that matter, the country where the Germans located most of the death camps). In Nazi work camps, many people (if relatively able-bodied to begin with) were set to “work” to be starved, tortured both psychologically and physically, and killed in droves by disease and exhaustion because of the terrible conditions. In Nazi death camps they were killed at the outset, although a very small percentage were spared briefly to help with the cleanup of the mass killing in exchange for a few more months of life, or to work at certain other tasks for a while under conditions that would ordinarily kill them rather quickly (within months as a rule). The object was to eliminate them as a group from the face of the earth, and certainly from Europe. That was the stark reality, and it is obscene to make the comparison so many people are making. If you want to read some exasperatingly reasonable discussion of the complex immigration situation, try Damon Linker or David Frum. I'm usually not much of a fan of Frum, but I think he's on target here. Damon Linker is often interesting. He seems to consider himself on the left--"center-left" I think is the term he uses--but is willing to take conservative and/or populist concerns seriously and to characterize them fairly, which is unusual to put it mildly. Well, I didn't intend to write that much about politics. Now I've run out of time for the music-related post I had planned. Next week. For more than ten years we had a Meyer lemon tree growing beside our front steps. In many of those years it bore more lemons than we knew what to do with. This is a how it looked in its glory days, a picture of a few branches of a tree that was eight feet or so tall. When life gives you this many lemons, limoncello, not lemonade, is the appropriate response. Several years ago my wife made a big batch of it, several quarts at least, stored in Mason jars. It's delicious and very potent, made with a base of Everclear. I've been using this neat little bottle to dispense it. It originally contained two different and delicious liqueurs, brought from Europe (France, I think) by one of our children. I liked the bottle(s) so much that I didn't want to throw it (them) away, and have been using it for limoncello for a while now. A few days ago I poured the last of the limoncello into it and took this memorial photo. I call it a memorial because this not just the last of that big batch: it's the last ever from our lovely lemon tree. Several years ago we had an unusually cold winter which had the tree covered in ice for several days. It lost all its leaves and we thought it might be dead, but it recovered, partially, and gave us a few lemons the next year. Then the year after we had another cold spell, not quite as bad as the earlier one but enough to kill back all the leaves, and that was pretty much the end of the tree. This spring only a few living branches were left and we finally cut it down. I'll spare you the sad sight of the stump. It's a sort of novel, written by Mark Frost, the co-creator of the series. It provides a great deal of fascinating background for the story by means of a wonderfully entertaining mixture of truth and fantasy. You learn a lot about people and events from the series, but you also get some history and context that are not even suggested by the series. For instance, the book opens with some odd incidents in the life, and odd circumstances about the death, of Meriwether Lewis, and works forward in time until shortly after the time of the original story, with a link to the present day. I'm expecting that link to be present in the new series; we'll see. And I had a very good time reading it. The premise is that in the present day a cache of documents relating to the town of Twin Peaks, its inhabitants, and certain events that occurred in the late 1980s, has been "recovered on 7-20-2016 from a crime scene." Deputy Director Gordon Cole has given it to an agent identified only by the initials T.P. for "comprehensive analysis, cataloging and cross-referencing.... We need to learn and verify the person or persons responsible for compiling this dossier...."
The book then consists of "documents" assembled by that unknown person, who refers to him or herself as "the archivist," typewritten annotations by him/her, and marginal notes from TP. It's a very elaborate physical production, and you can easily pretend that it's all genuine history, or at least I could. I noticed the other day that an audio version is available. Don't. That would at best be like reading a script instead of watching a film. I always did like Major Briggs a lot. Doug Milford is full of surprises. The Log Lady's attachment to her companion is eccentric but not crazy. My wife gave me the book for Christmas last year. I started reading it, but when it reached the point in time where characters from the series began to appear, I realized that my recollection of the series was pretty spotty. So I stopped reading and over a period of weeks we watched the series again, and then the "prequel," and then I went back to the book. I ended up being very impressed all over again with the series. Even the latter part of the second season, generally thought of as a mess and a letdown, seemed better than I remembered. I now feel fully prepared to watch the new series and hope it won't be a disappointment. I deliberately refrained from reading any reviews or commentary on The Secret History because I didn't want to be prejudiced, or to learn anything that might have reduced the pleasure of reading it. And I still haven't read any. But I can imagine that some readers might be disappointed that it really does not answer a lot of questions that the series left open, questions about the specific events portrayed. I didn't feel that way, but others might. It's not about those events, and really only touches on them; it is, as the title says, about the history of the place, the forces at work there, and certain of the people; many characters from the series do not appear at all. And in what it does tell it not only leaves a lot of earlier questions unanswered, but raises new ones without answering them. It wouldn't really be true to Twin Peaks if it didn't. And in one important respect the book is not Twin Peaks: it's not really very Lynchian, which is to say it's not seriously weird. It doesn't have the depth or mystery of the series, even though it's about mysterious things. But then the whole premise is that it's a strictly factual dossier. But what happens when that trust disintegrates? In particular, what happens when the issues closest to people’s hearts are neither discussed nor mentioned by their representatives, and when these issues are precisely issues of identity—of “who we are” and “what unites us”? This, it seems to me, is where we have got to in Western democracies—in the United States just as much as in Europe. And recent events on both continents would be less surprising if the media and the politicians had woken up earlier to the fact that Western democracies—all of them without exception—are suffering from a crisis of identity. The “we” that is the foundation of trust and the sine qua non of representative government, has been jeopardized not only by the global economy and the rapid decline of indigenous ways of life, but also by the mass immigration of people with other languages, other customs, other religions, other ways of life, and other and competing loyalties. Worse than this is the fact that ordinary people have been forbidden to mention this, forbidden to complain about it publicly, forbidden even to begin the process of coming to terms with it by discussing what the costs and benefits might be. And when the pre-political “we” has, for whatever reason, been jeopardized, it is too late for the political process to deal with it. Emerging from behind the politics there then appears another and deeper question, the question who we are. There's considerably more to the essay than this, and I think the whole thing is available online to non-subscribers, so I suggest you read it. But the deterioration of that 'pre-political "we"' is part of the reason that Trump was elected, and no doubt part of the reason for Brexit. And both those events have damaged it even further. Do committed Hillary voters feel that committed Trump voters have anything much in common with themselves? When left and right say "we" do they intend to include the other? Not that I can see. We're at a point in the U.S. where a presidential election is seen by one side as a sort of coup by the other, with dire consequences expected for the latter. I'm inclined to think the breach is irreparable, but maybe that's too pessimistic. Scruton himself proposes some attempts at repair. We were discussing drinks last week. I seem to have invented one which I like very much. I more or less stumbled on it last summer one day when I wanted a martini. I was out of gin, and I don't consider vodka martinis to be martinis. So I messed around and ended up with vodka, vermouth (dry), lime slice (squeezed), and club soda. I make it roughly half-and-half alcohol and soda, but obviously that would be a matter of taste. It's really good if you like non-sweet drinks. There is no trace of sweetness in it at all. As far as I've been able to determine by asking people and searching the web, it's not a known species. So I think I get to give it a name. I immediately thought of something related to moonlight. I wanted Half Moon, because that's the phase of the moon I enjoy most, when the moon is over the bay at the time I'm typically there. But Half Moon is already in use, as is Full Moon. Bay Moon? Silvery Moon? Silver Moon? Feel free to vote and/or make suggestions. And fix yourself one, if you think it sounds good. This may taste good to someone who has never eaten a biscuit. From Lee Smith's memoir, Dimestore. Which I recommend. Bagels are fine. I've eaten a good many over the years. But they aren't as good as biscuits. And really I never quite got over the fact that they look like doughnuts but aren't. Vanilla does not equal plain! It's a delicious flavor. I love vanilla ice cream, and for that matter vanilla almost anything. A few months ago I saw these in the grocery store while I was looking for another favorite, ginger snaps, and have become very fond of them. My preferred alcoholic beverage is beer. I love beer. I'm not sure exactly when my willingness to drink beer for the sake of being grown-up (and drunk) turned into a real enjoyment of beer for its own sake, but I don't think it took very long. And it really solidified when I discovered beers with more character than the standard American product. One instance of genuine progress in this country over the past forty years or so is the wide availability of imported and craft beers. Cultured persons are supposed to like wine, and know something about it, but I've never developed any great enthusiasm for it. I actually made a deliberate decision years ago not to attempt to develop the taste for good wine, because I knew it would be an expensive one. But more fundamentally--and I don't care if this marks me as a bit of a clod--I just don't like it as much as I like beer. I'm not a connoisseur of beer, either, but I know what I like. My wife and I occasionally go out to dinner with another couple, and the three of them share a bottle of wine, while I drink Sweetwater 420. My standing order for birthday and Father's Day gifts is a six-pack of Guinness Extra Stout and a bag of Cheetos. (Someone remarked that that sounded like a vile combination, so I'll clarify: they are two separate indulgences.) But I'm happy with lesser stuff. I'll only drink "lite" beer if I really want a beer and it's the only thing available, but I recently had a regular Budweiser, which I hadn't done in a long time, solely because it was cheap, and enjoyed it. As for hard liquor, I have over the years only rarely ventured far from bourbon and scotch, straight, or on the rocks, or with water, or, in the case of scotch, soda. Now and then I've experimented with mixed drinks, and I like one every now and then, but mostly they're not something I want regularly. A few years ago one of my sons brought back a bottle of Ron Barrilito rum from a trip to Puerto Rico and introduced me to the Dark and Stormy, which when made with that rum and Reed's Ginger Beer, is wonderful. But it's not something I want to drink regularly, and anyway Ron Barrilito is not available here, and the drink when made with Bacardi and ginger ale is not that different from other soft-drink-and-liquor combinations, which I generally dislike. But over the past couple of years I've added another drink to my small list of staples: the martini. I don't think I'd ever even had one till eight or ten years ago, and that was only out of curiosity--it is, after all, a storied drink, though associated with a culture rather different from my own. Unlike my other experiments, this one kept drawing me back, and now I think I'm a confirmed fan. I mainly like it in the summer. The summers here are very hot and humid, and the martini is cold and dry. Sweet drinks have a lot of initial appeal, but for a slow sipper like me they grow thin and warm before I'm finished. Conventionally, a summer drink is something sweet and tropical. But where the summers are brutal, the most desirable drink for the season is one that is the opposite of summer, a drink with the chill and clarity of a windless and cloudless winter day. There is absolutely nothing sweet about the martini as I make it, and I make very sure it's cold and will stay that way until I've finished it. I've experimented with different approaches preached by various self-styled experts on the web, and what I've settled on seems to make me somewhat of a traditionalist, but also somewhat of maverick. On the traditional side, I refuse to use the unqualified term "martini" for any drink that does not include gin and vermouth. A vodka martini is just that--not a martini, period, but a qualified one. Nothing wrong with it, but it should be called what it is. Concoctions that are labelled as martinis just because they are served in a martini glass don't even deserve mention; vodka and apple juice may make a pleasant drink, but they don't make a martini. I also observe the olive tradition, if only because I very much like olives, and love that finishing touch of salty gin-soaked olive at the end of the drink. One is not enough, but having read that a gangster was once identified to his assassins by the placement of three olives instead of two in his martini, I superstitiously limit myself to two. And four seems excessive. On the other hand, my martini is not served in a martini glass, because I don't have one (I did, but it got broken), and, more importantly, because a normal-sized martini glass doesn't leave enough room for ice. Yes, I have it on the rocks, which seems to make it in some views not a true martini. I tried the crushed-ice-and-shaker technique, and the result is fine for a few minutes, but it gets warm long before I'm done with it. And I keep the gin and vermouth in the refrigerator, which seems to be frowned upon. And I have no patience at all with the extreme dryness snobs, who seem to take it as some sort of a challenge to see how little vermouth they can use and still feel entitled to use the word "martini." You know the sort of thing: "wave an open bottle of vermouth back and forth several times over the glass", etc. 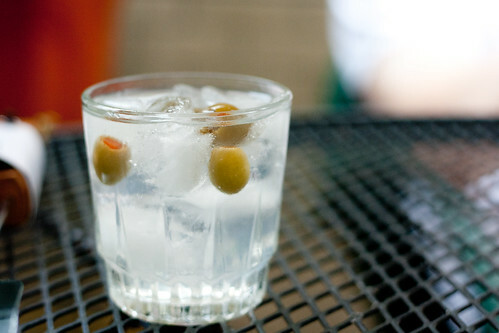 If you want to drink straight gin, or gin with olives, go ahead. But why make a fetish of minimizing the thing that makes the martini something more? I don't measure, but I think my gin-vermouth ratio is about five to one. I use inexpensive gin and vermouth. I actually prefer the cheaper and harsher Gallo vermouth over Martini, because the latter, while smoother, and better as a drink on its own, is a bit sweeter. It's October, and of course that's still late summer here. This afternoon I came to the end of both the gin and the vermouth. There was a little too much of both for a single martini, but not enough to save for another day. So I made myself a martini-and-a-half, of which I enjoyed every sip, and which left me wondering how anyone could, as legends have it, drink three martinis at lunch and still be able to do useful work--or, in my case, even walk. Sometime around next May I'll replenish the supplies. Or maybe sooner. Maybe I'll try some kind of expensive gin; one always wants to make a good thing even better. But then again, that may not be a taste I ought to cultivate. (Except for the number of olives, and maybe the amount of ice--I use less--this looks very much like one of my martinis, down to the style of the glass. This photo is from the Flickr account of Josh Ames; since code for embedding is provided, I assume it's ok for me to use it. By the way, speaking of mixed drinks in general: five or six years ago I was at an event--I suppose it was a cocktail party, though that is a pretty foreign term to me--hosted by a consulting firm looking to be hired by my employer. A young lady came around taking drink orders, and I asked for scotch and soda. I thought she looked a little disconcerted, and she hesitated for a second, maybe as if she were about to ask a question, then decided not to. A few minutes later she brought me something that looked like scotch and soda, but I almost spat out the first sip: it was scotch and Seven-Up, or Sprite, or something of that sort. It was nasty. This arose in connection with an incident related on Facebook in which a British-born wife requested that her American-born husband bring her some noodles, and was displeased when he brought her a species of pasta. It turns out there are some significant variations in usage of the term "noodle." As Wikipedia says: "The material composition or geocultural origin must be specified when discussing noodles." I'm not entirely sure what the wife had in mind, but I think it was some sort of Asian noodle. If you had asked me, I would have said, as several people in the discussion did, that noodles are a subset of pasta, namely pasta in an elongated cylindrical or tubular form--that is to say, recursively, noodle-shaped pasta. Where I'm from, one might refer, for instance, to "spaghetti noodles" when referring to the yellowish-white part of spaghetti, and "spaghetti sauce" when referring to the red part. And fan- or corkscrew-shaped pasta would not be called noodles. But then there are flat noodles, too...still, they are noodle-shaped in being elongated. I think "pasta" is a word of relatively recent introduction to middle-class America. At any rate I don't recall it being used when I was growing up. There was spaghetti and there was macaroni, and each had its characteristic noodle, and I don't recall other varieties of pasta, though at some point--in the '70s, maybe, with the advent of the yuppie--the word became widespread. I'm interested in what the usage is in other parts of the country and the world. Do you think of noodles and pasta as two different things? If you asked for noodles and got pasta, would you be annoyed? Also noodles, but not pasta? It was just over a year ago that I wrote about sampling this legendary substance: see this post and this one. I ended my reflection saying "I haven't been back to the Marmite jar. I do plan to finish it, but I probably won't replace it." And I more or less forget about it until a few months ago, when I noticed the jar in the cabinet and tried it again. And then just a few days ago, I said words I never expected to say: "We need some more Marmite. We're almost out." And, at Janet's blog, a link to some enthralling nature photos at National Geographic. I'll send you over there instead of just swiping the link in case you haven't visited there lately, because there are other good posts.